Earth Day 2018 – Ending Plastic Pollution. A Greenbelt Act of the Imagination. Each year Earth Day asks people around the world to come together and think about how we can be better at protecting our planet. This year Greenbelt and lots of other independent festivals have decided to take a stand over plastic pollution. We’re getting “Drastic on Plastic”. Building a festival is a wonderful thing, but the process of turning green fields into a beautiful site and then back again involves stuff. Lots and lots of stuff. As people trying to create a sustainable festival, we have endless choices to make. What do we buy? How much do we need? Where does it come from? How far has it travelled? How is it packaged? Is it Fairtrade, organic? It can be a little overwhelming. One of the most important questions is this: where will all the stuff we use end up? The reality is that if the item is made of plastic then it may well end up in landfill or being burned, even with our best efforts to recycle. As a festival team we aren’t OK with that. We are never going to be OK with that. So, we’re doing something about it. Greenbelt has banned the sale of single-use plastic bottles this year. We’re also working hard to remove all other single-use plastics from site, too, with the aim of being single-use plastic-free by 2020. In previous years, we have seen lots of single-use plastic bottles going into our recycling bins. But with 5.5 billion plastic bottles being landfilled, littered and burned annually in the UK (and with the average British person using more than 150 single-use bottles every year), we wanted to model a different way of doing things. If all our festivalgoers, artists, volunteers and crew were to ditch single-use bottles for a whole year, then in that one year we could reduce the number of plastic bottles created by 2 million. It’s a big number. The more people we can bring on board with this refill revolution – the more effective it will be. And this isn’t, of course, just about the festival weekend. This is about inspiring people to make change in their everyday lives. 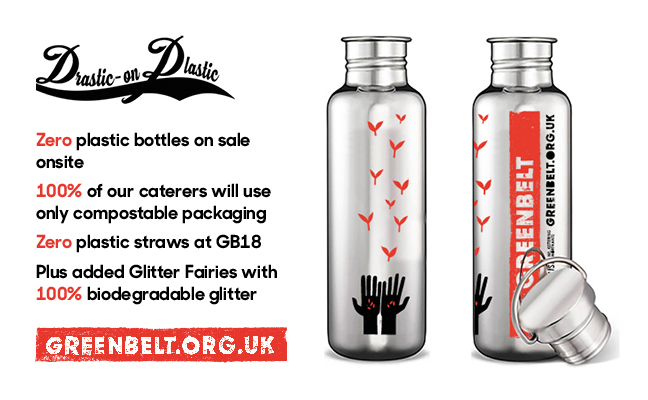 We are even making the sparkle eco-friendly at #gb18 by introducing The Glitter Fairies. Most glitter is microplastic, so this year our glitter fairies will be on hand to sparkle you up with totally biodegradable glitter which comes in glass containers. Greenbelt is also supporting the “Final Straw” campaign – meaning plastic straws are banned onsite this year, too. This will impact on drinks producers, as we are telling them that unless they can supply children’s juice drinks (for instance) without plastic straws, we will not be stocking them at the festival. Our bars now stock only re-usable cups, meaning no single-use plastics being thrown away from the Jesus Arms or Blue Nun. The cups are washed and re-used many times and when they do eventually reach the end of their life they are turned into useful things like coat hangers and ice scrapers. As we look towards 2020, we will continue to ask ourselves where the bits we use to build the festival will end up and how we can further reduce the amount of festival stuff going into waste streams. And there will, of course, be many challenges along the way – not least with our plan to remove all single-use plastics from the site in one year, this year!